The best suit! 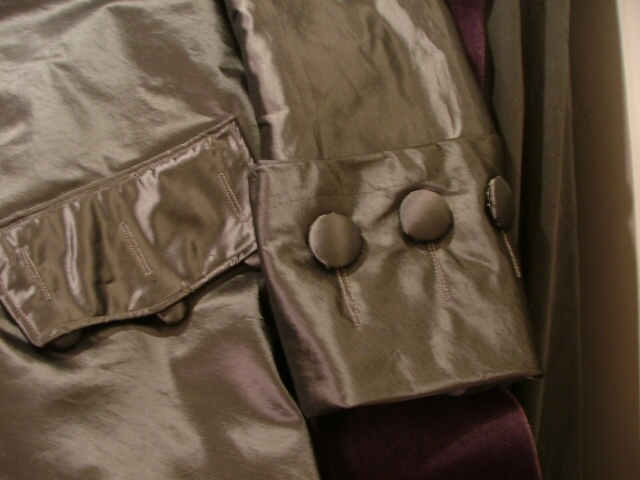 The corduroy began life as a set of curtains in my parents' house when I was a baby. We held on to the fabric. In high school I decided I liked it and wanted to make a jacket. 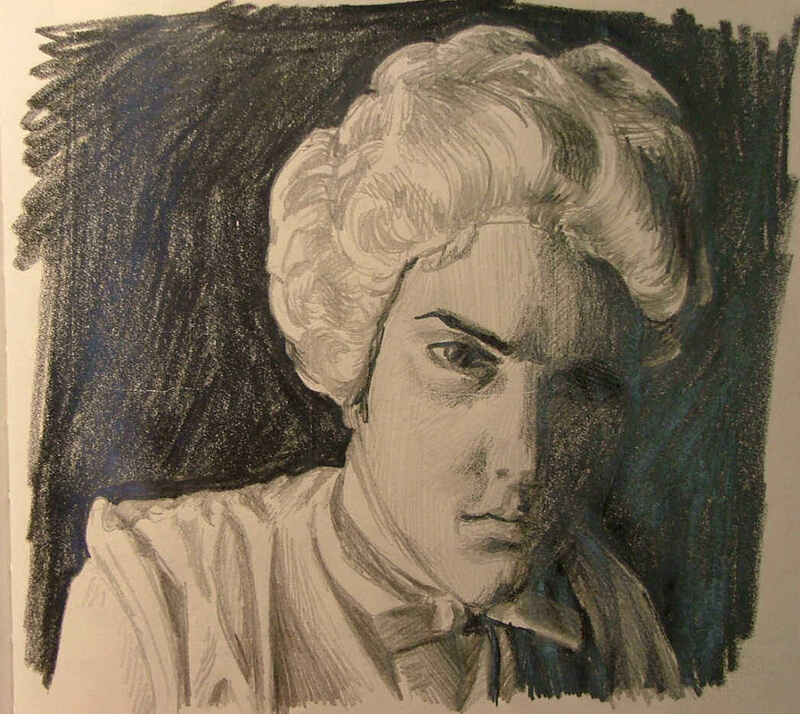 It was pseudo 18th century at the start of my true obsession. 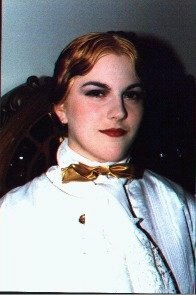 I was about 16. I'd always loved George Washington's fashion sense as a kid but never gave it much thought until I started researching it all in high school. I made quite a few things in high school in quick succession and learned a lot on a tight budget. I decided I needed to embroider it in silver from the beginning and designed the embroidery pattern. I started work at the top of the front. 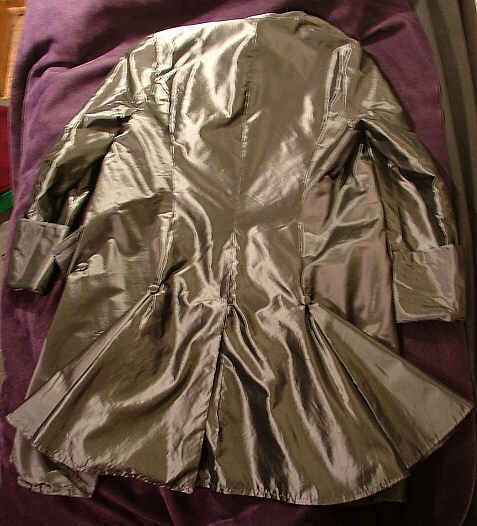 Then I lost steam and the coat hung in my closet for years before I got motivated to finish it... and oh what a finish. 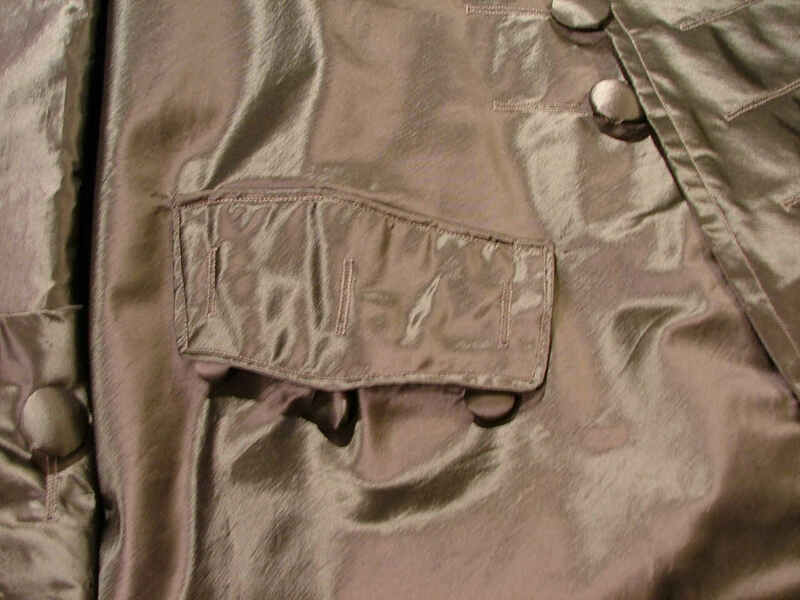 I added more fabric to the skirts, and stiffened them with this nasty iron-on-plastic interfacing, plus buckram. It's really stiff as a board in the skirts, and you can't sit down properly. But this finally achieved the effect I'm looking for. Also late in the game I added the cuffs, shortened the sleeves, and altered the fit. Too bad I started the embroidery with almost zero experience! It looks amateurish to me... Thinking about hiring the embroidery out in the future. For more info on the creepy mask see further down the page. 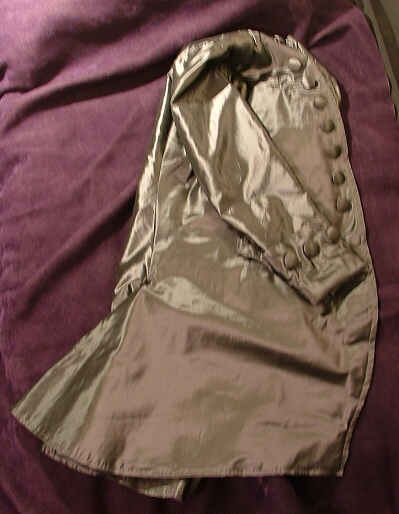 Breeches to match. 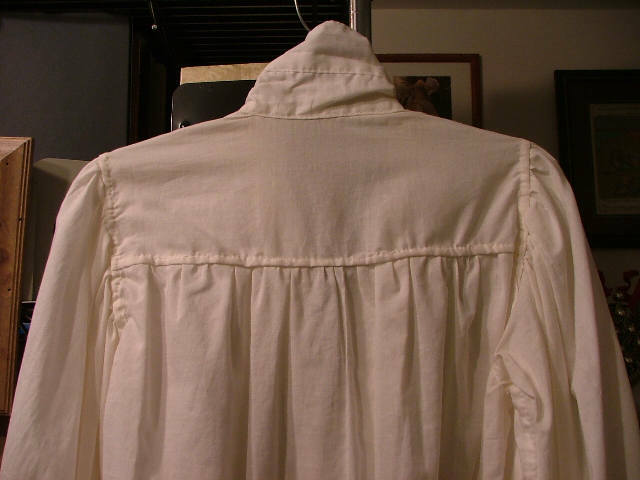 Had to use a fly-front instead of a fall-front, due to lack of extra fabric. 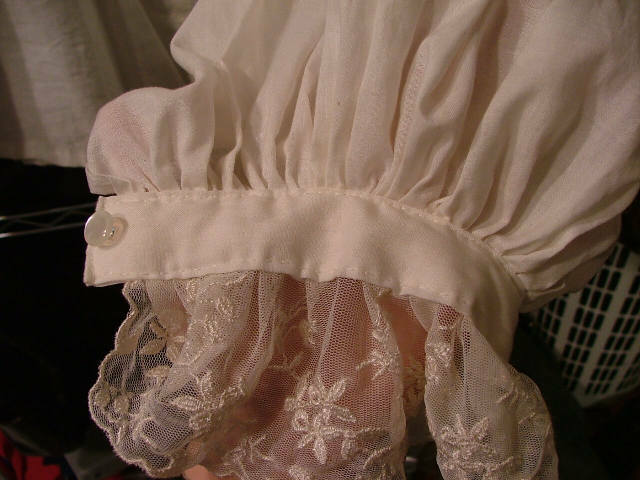 Much to my relief I discovered that a button fly front is accurate for this early 18th century impression. 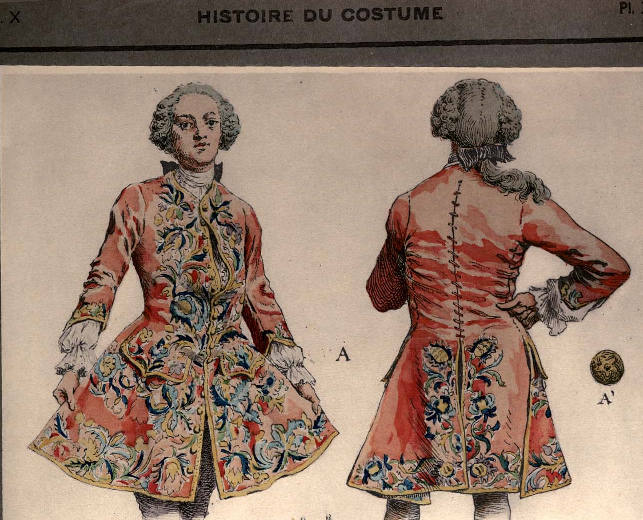 Fall fronts came more into vogue later after waistcoats shortened and you could see the front of the breeches. 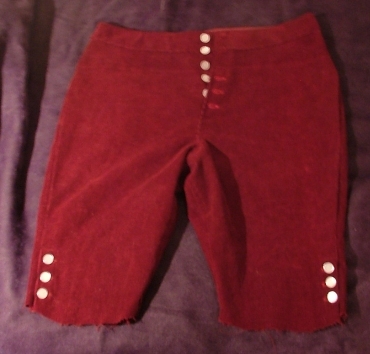 I attempted to create a period pattern (in which the legs are spread wide apart when you lay the garment flat) but I couldn't quite figure it out, and the small amount of corduroy I had finally stopped this. I created the pattern from a pair of my jeans. 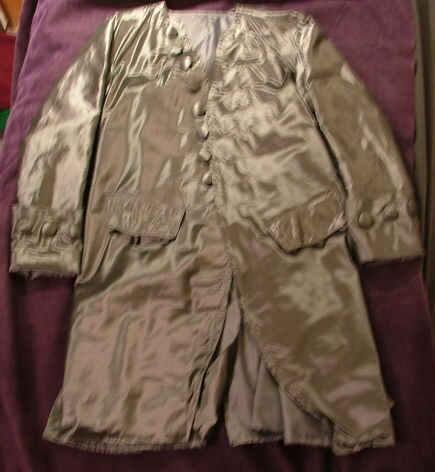 I have a design for a matching waistcoat in pearly grey satin, covered with coordinating embroidery, but I haven't started on it. See the pattern pieces below. 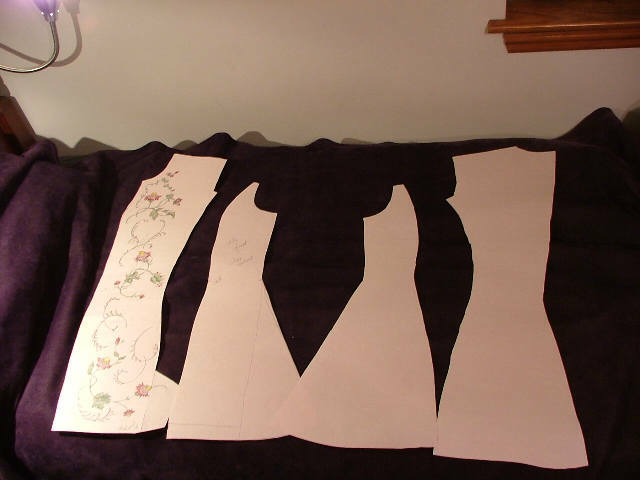 I've got more seams than the original patterns, because I don't fit well in straight-cut men's garments. 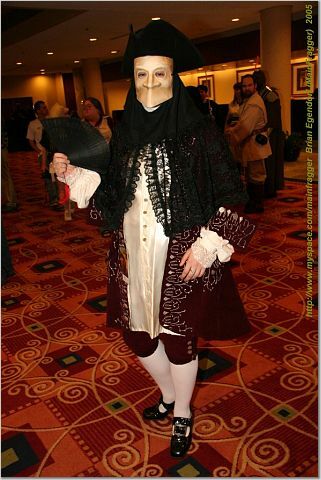 Bautta: Black hood for wear with volto (or larva) Venetian mask. Couldn't find anyone selling this item, so I examined some paintings and made my own. Absolutely necessary accessory for wear with the volto. It seems that the names have commonly been confused - you will see the white mask advertized as a "bauta" nowadays, but originally this term referred only to the hood. 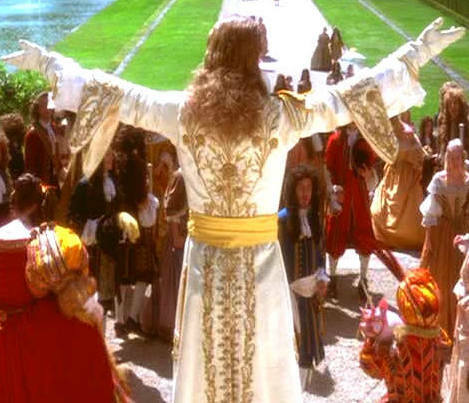 The mask I've got is from Venice, papier-mache. I went all over the city determining which mask shop had the best traditional masks. The shop was Ca'macana and they sell online. They seemed to have the best selection and quality. No plastic mask here! 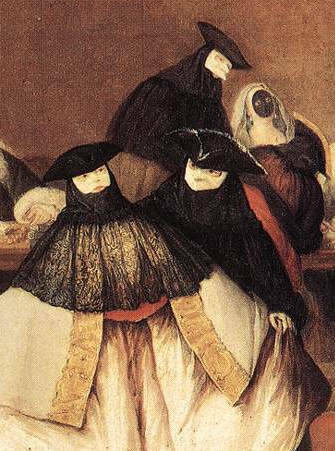 Painting by Pietro Longhi, 18-century Venetian painter. 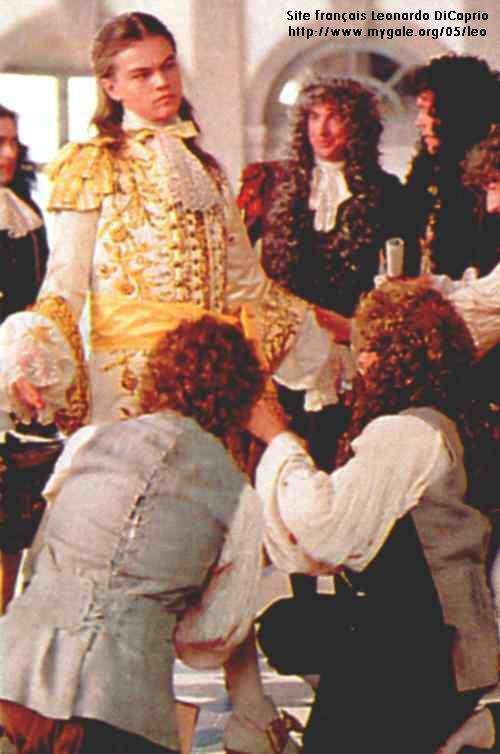 You can see the detail of the bautta here. 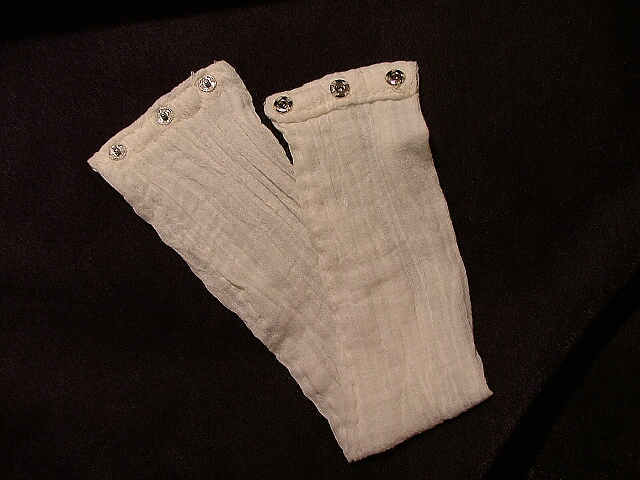 Sewn completely by hand - really adds to the authentic feel. 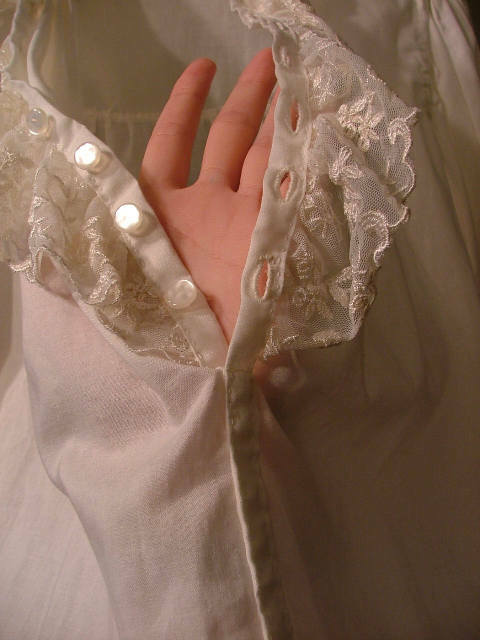 It took me a while to realize that I enjoy sewing by hand and prefer it to machine sewing. I'd always been told that machine sewing is so much easier, but I don't agree. 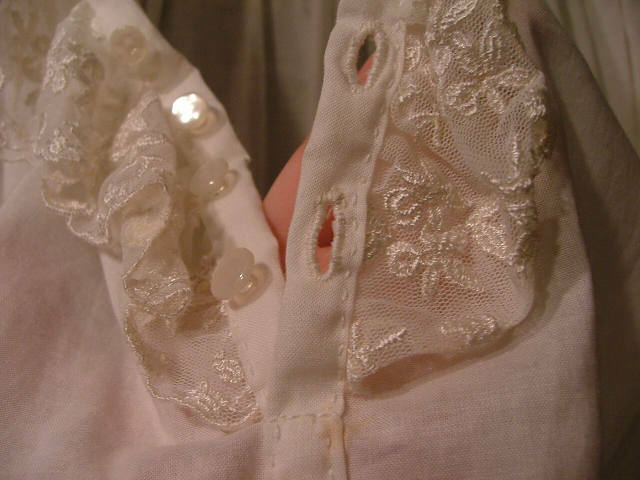 Sewing by hand takes longer but it's less stressful, more like a meditative exercise. 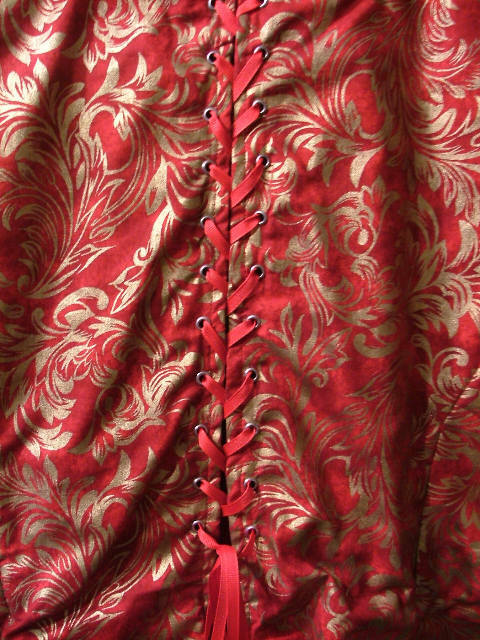 Similar to embroidery. I made a very soft stock which closes with snaps. At the time I didn't realize that you can order the buckles... but the snaps make it so easy to put on that I'm happy with this one! 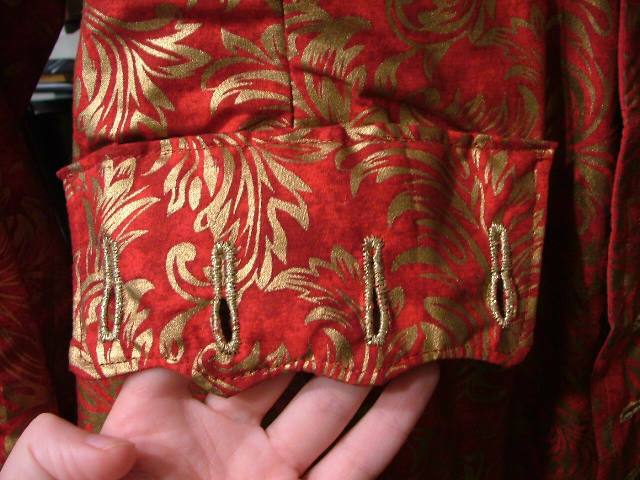 unfortunately machine sewn, but the buttonholes are all embroidered, which I think really gives it a nice look. 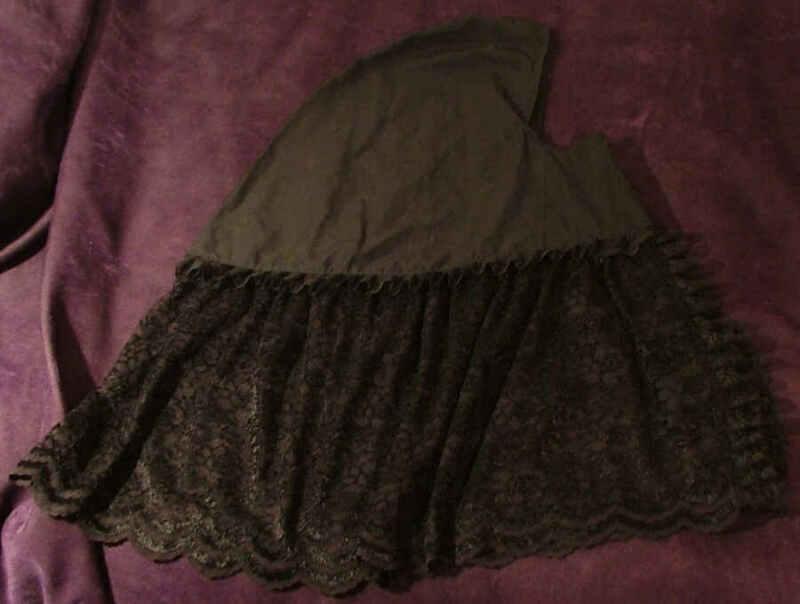 I made the pattern by looking at the image below, including the skirts and design of the lacing in the back. 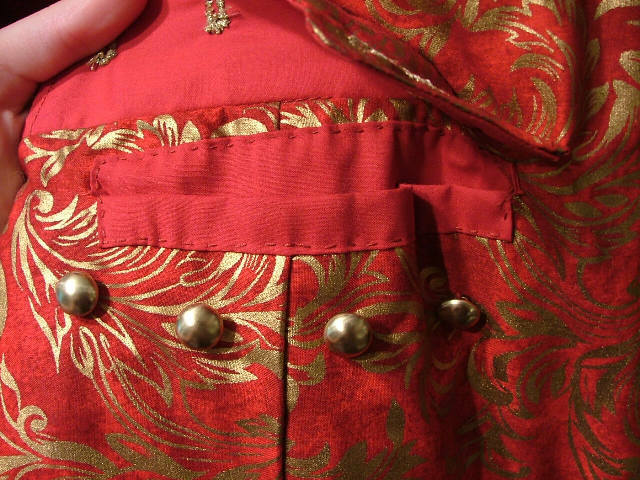 Fabric is cotton printed with gold ink. 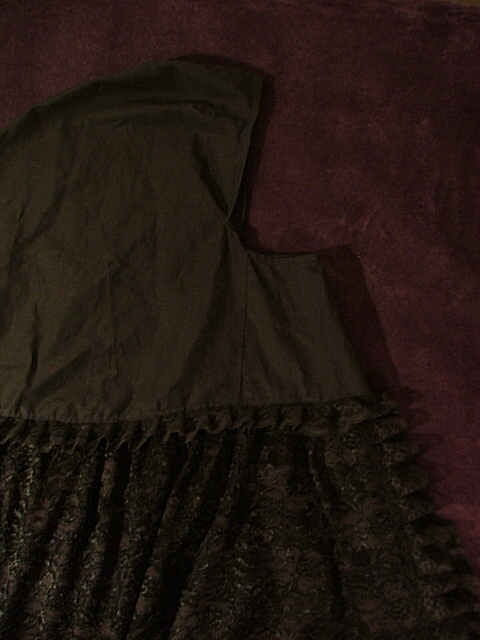 Skirts are lined with interfacing and are a little stiff. 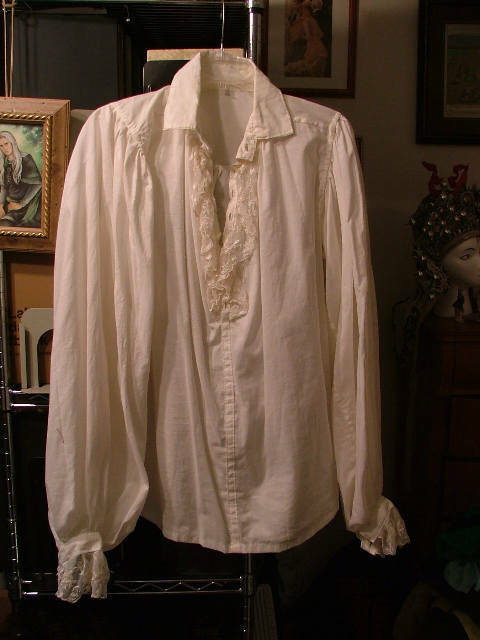 My one big mistake with this was to line it in plain cotton, because it grips the shirt worn underneath and makes it hard to take on and off. Also see here my reference image. 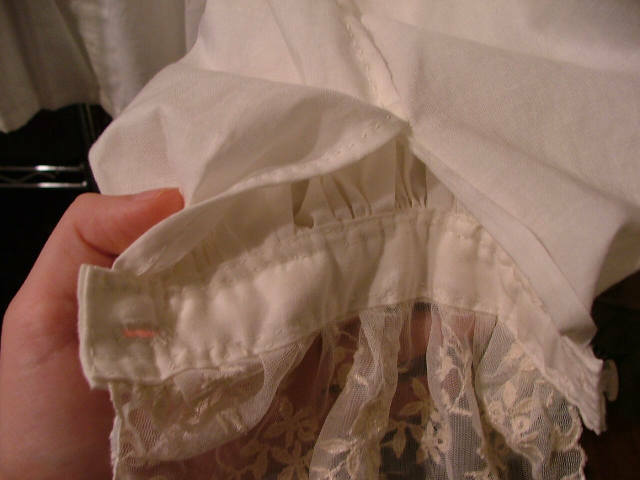 I never knew before that waistcoats had lacing in the back, but it's a great idea. If your weight fluctuates you could simply loosen or tighten in the back and still look great! 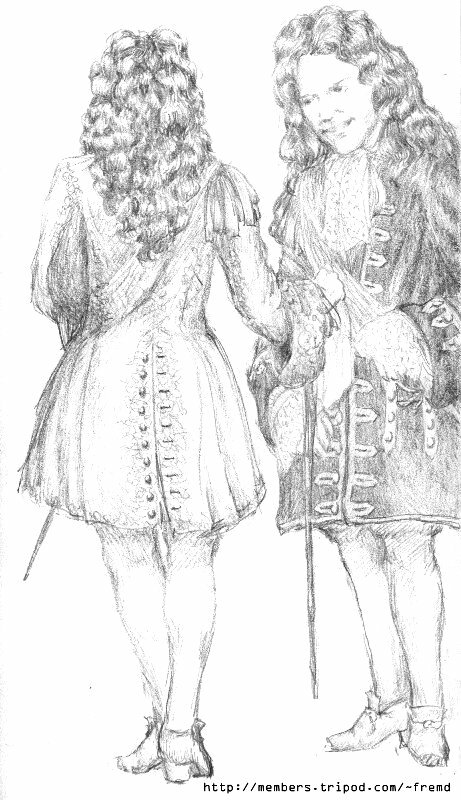 Below the waistline the skirts are split. I tried to get accurate here in my pattern design, using one large piece for the front/sides. 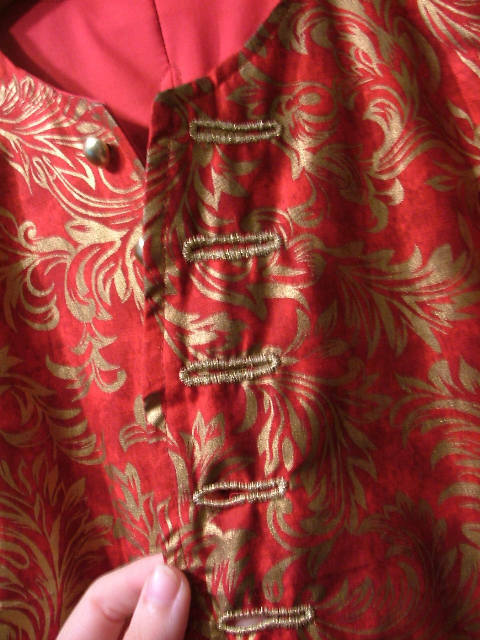 This is a late 18c coat. 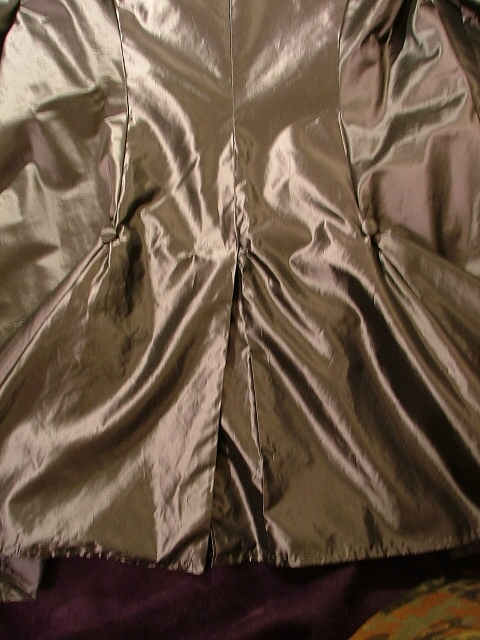 The only seams along the body are the center back and backsides. 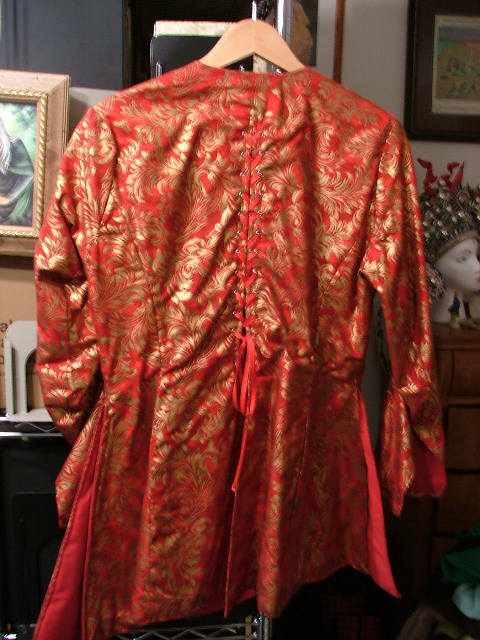 The two-piece sleeves turned out nicely, but the body of the coat fits in a really bad way. Perhaps it would be more flattering on a man! 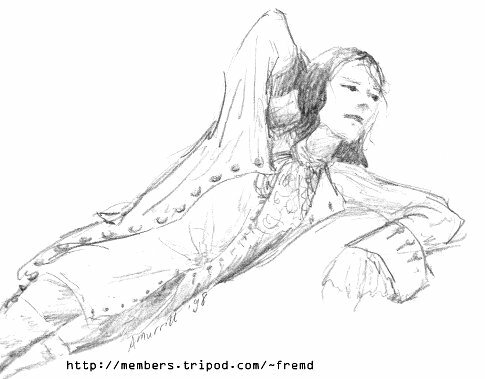 I was not careful with this one, and paid the price in a shoddy garment. 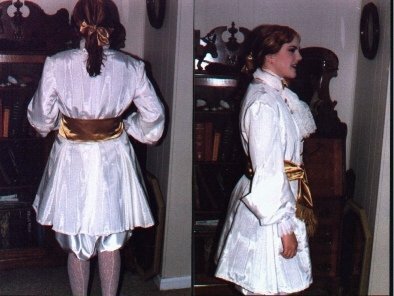 My first suit-- I made this to wear to my high school prom. 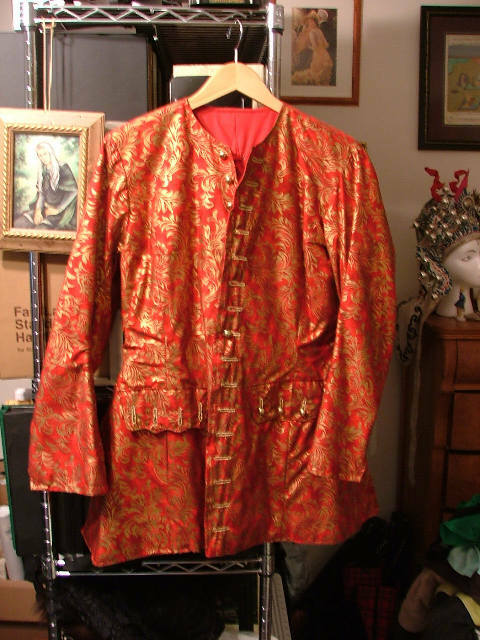 I was inspired by a suit worn in the movie The Man in the Iron Mask by Leonardo DiCaprio. Very poor construction and detailing, because I was in a huge hurry to complete it in time, and had no experience. But I did manage to make an entire suit. I couldn't believe how many BUTTONS this required!